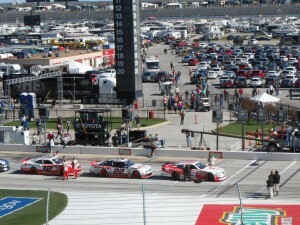 This past weekend all three of NASCAR’s top series came to Fort Worth, Texas. 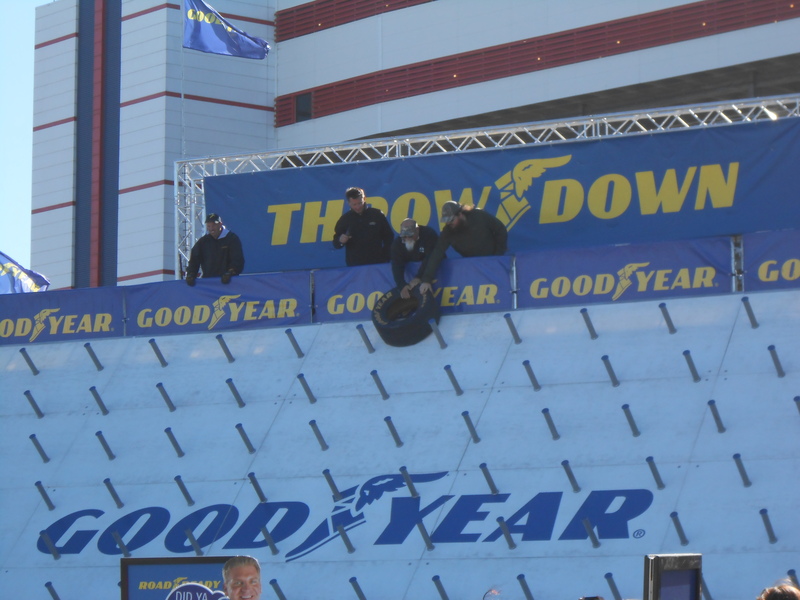 From Friday night to Sunday afternoon, the track was a flurry of activity as thousands of fans came from far and wide to see their favorite drivers in the Camping World, Nationwide and Sprint series up close and personal. And while it was the action on the race track that they were coming for, fans were given a veritable plethora of ways to get into the race experience before a single lap was run on the track. The prerace week activities start with the arrival of the show cars. The show cars travel the country during race season on the back of trailers like a band of high octane gypsies parking in front of grocery stores and other outlets where fans can see the cars up close and occasionally get a poster with their favorite driver on it. The annual parade of show cars hit the Walmart outside of Texas Motor Speedway over the weekend. 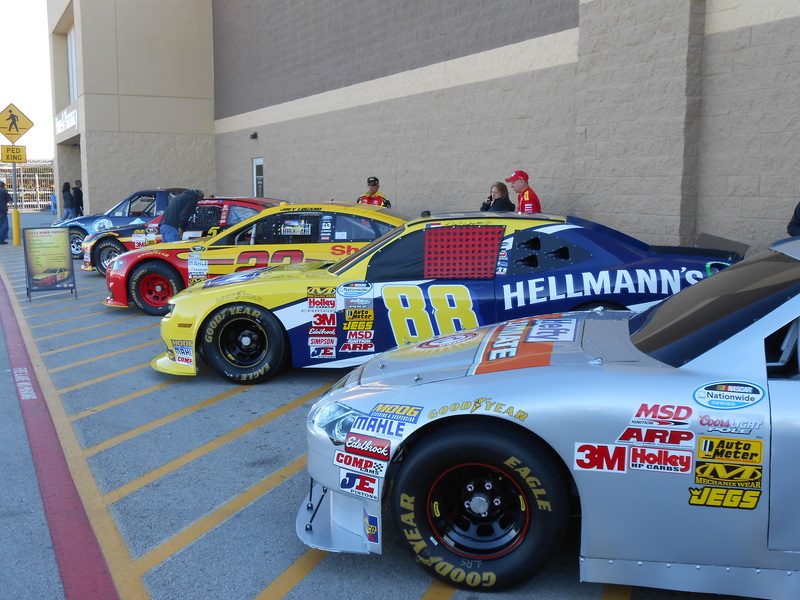 One popular stop for show cars and fans alike heading to the Texas Motor Speedway is a Walmart located about five miles away from the speedway grounds. Even though published reports stated that there would only be one show car at the Walmart this year it appears that car brought a few of its friends along as around a half dozen show cars were parked outside the Walmart Saturday morning. Once a fan has their fill of show cars it is off to the race track where the entire front stretch is turned into a fan carnival of sorts with vendors of all shapes and sizes competing for the attention and in some cases money from the loyal fans. And NASCAR fans are certainly loyal which is why so much is spent on sponsorship. Study after study has shown that fans will flock to certain products if they are endorsed by their favorite drivers. While I have never ruled out a certain product just because it was endorsed by a driver I did not like, I did tend to buy Valvoline oil more than any other oil when Mark Martin drove the Valvoline sponsored car. 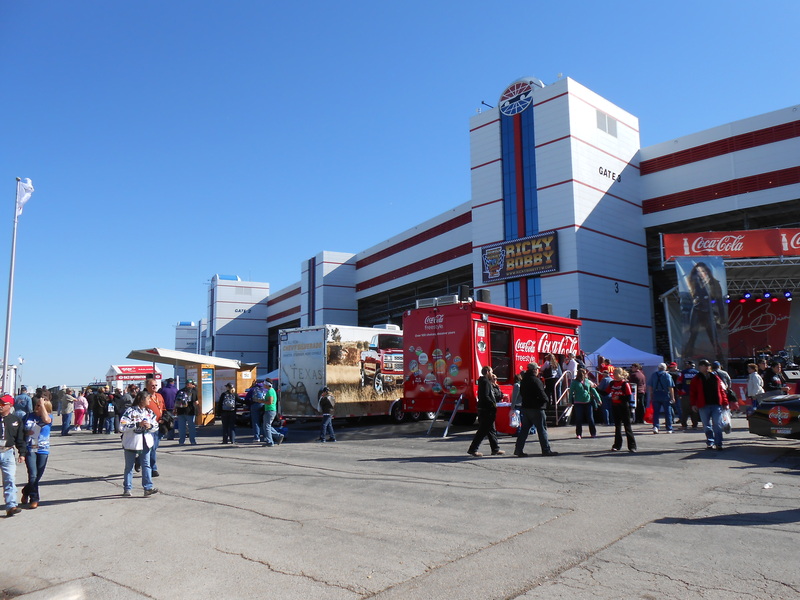 On race weekend the front stretch of Texas Motor Speedway, like all NASCAR tracks, is turned into a carnival of sorts where vendors peddle their wares and fans look for a bargain on driver gear. And with virtually every inch of both car and fire suit available for a sponsor’s logo it is a given that a sport built on commercial partnerships such as NASCAR would create an environment where their commercial partners can lure the fans in to marketing studies under the guise of a free hat or T-shirt. One would be hard pressed to walk more than five feet in the fan experience zone without having someone “barking” at them to try to win something or to fill out a survey for this or that. It should be noted that the midway at a NASCAR race is not just about product placement and giveaways. 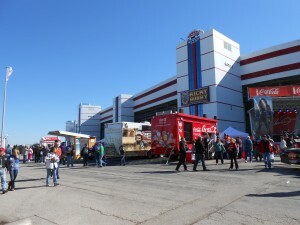 The midway also includes numerous merchandise trailers where fans can get the latest driver gear and in some cases meet the driver’s during autograph sessions. Of course drivers were not the only celebrities in town as part of the traveling circus that is NASCAR. John Godwin and Justin Martin of the television show “Duck Dynasty” take part in a game of tire plinko at the fan experience in front of Texas Motor Speedway. With the understanding that many fans of NASCAR are also fans of the two shows, it was a given that stars would want to meet and greet with some of their fans. And all of that shopping and survey filling is bound to work up an appetite so there are various vendors selling food and drinks from all ends of the spectrum to help provide that needed nourishment. So even before stepping foot inside the track itself fans have hours worth of entertainment in the shadow of the grandstands. Oh yeah, there was also a race going on in side the track facility. Once inside the track the parade of sponsors continues with name dropping of various sponsors that helped make the race possible. Almost every inch of available space is adorned with a sponsor logo of some sort. In some cases one sponsor is the presenter of said event with another sponsor being called out as the primary sponsor. 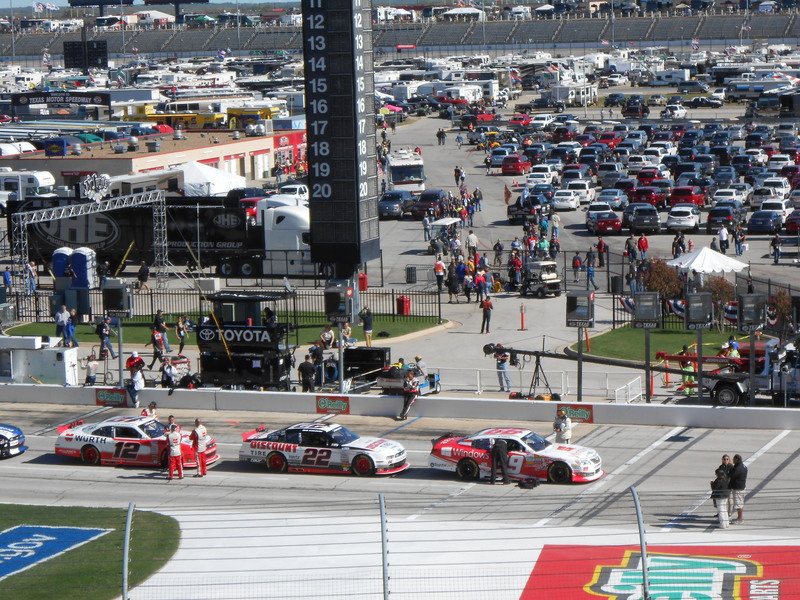 While it can be easy to forget there is a race going on inside with all of the fun happening outside the track Brad Keselowski (second car from right) won the Saturday race. During a sports marketing class in college we discussed the person behind sponsoring the broom used to sweep up sweat on basketball courts and whether they were a genius for finding a new revenue stream or someone who was taking things to far. In the years that have followed since that class and the new items that are now “sponsored” it appears that nothing is sacred if someone is willing to provide money to sponsor it. NASCAR has a televised prayer before each race and I am waiting for the day when the person giving that prayer is given a list of sponsors that need to be mentioned during it a la Ricky Bobby in “Talladega Nights” who is contractually obligated to mention a certain sports drink in every pre meal prayer. Once in awhile a minister will mention the name of the race in their prayer which does include the sponsor but it has not come to the full extreme of unnecessary sponsor name dropping while heads are bowed. Let’s just hope that no driver goes so far as to sell advertising space on their windshields since that appears to be the only area of real estate still up for grabs..
Now if you’ll excuse me, I have the urge to purchase some products endorsed by some of my favorite drivers; soda cookies anyone?